Above: My first FOTD of 2015. Earlier this week, my mom and I were in LA for a meeting and, much to our suprise, it began raining. Although she brought a coat with a hood, I was in no way prepared for the deluge that continued well into the evening. Instead of buying yet another umbrella, I opted for this TopShop hat...it artfully blocked the rain and, I daresay, it just might come in handy again this winter. For my first FOTD of 2015, I am happy to include said hat, along with some classic favorites (including the newly procured Zelens Lip Enhancer) for a clean and subtle look. Above: Bronzes, taupes and pinks for a classic look...it doesn't get any better for me than this! Above: After loving the Suqqu Frame Fix foundation, I was tempted to order the standard Suqqu Foundation in shade #25 (a perfect match for my NC 25 skin) from Harrod's in the UK. Above: Suqqu Mini Review...this foundation offers creamy, medium to full coverage with a natural skin finish. It is hydrating, yet long lasting (6-8 hours of touch up-free wear) and doesn't need to be set with a powder. It comes in a girthy glass jar and also includes a diamond-shaped sponge with its very own envelope holder for portability...genius! Above: I adore the Tom Ford Cream Eyeshadow in Platinum...the soft, glowing taupe has really grown on me over the past month. It is marvelous for a subtly shaded eye and, once applied, is entirely budge-proof. Above: The full eye look in direct sunlight. Above: I have been completely smitten with the Zelens Age Control Foundation (reviewed HERE) and, consequently, couldn't wait to try the translucent pink Lip Enhancer. Above: This ultra-rich and hydrating balm glides on the lips and imparts a baby pink glow that self-adjusts and deepens with each layer. One swipe and my lips are delighfully flushed a tender pink...a second and third swipe creates a bolder pink that brightens the face. I love how smooth and moisturized my lips feel over the course of wear! Above: A swatch of the Zelens Lip Enhancer in direct sunlight. The blue bracelet is an antique Art Deco piece with spinels, gifted to me at Christmas by husband! Above: Two coats of the Zelens Lip Enhancer, developed to maximum intensity. Above: After my love for the Cheek to Chic Blush in First Love, I also recently picked up the Charlotte Tilbury Cheek to Chic Blush in Love Glow, an ethereal light pink. Above: A close up of Love Glow in direct sunlight...the outer ring is a luminous peachy pink and the inner circle is a light rose for a natural flush. 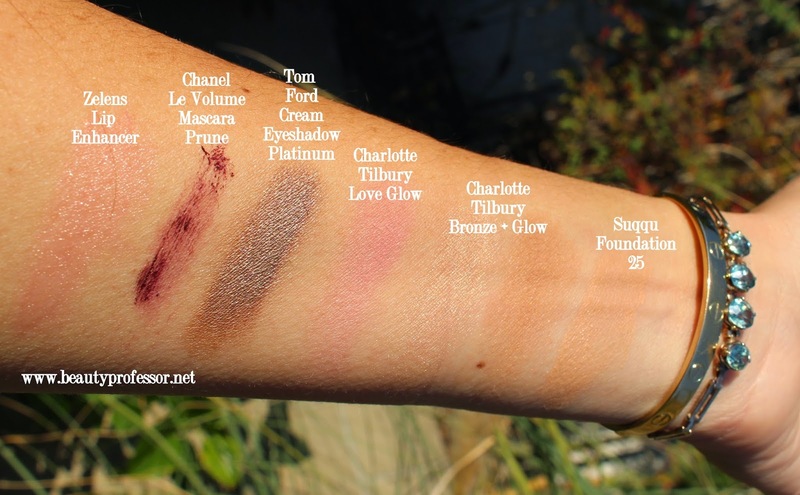 Above: A swatch of Love Glow in direct sunlight...it is glowy rather than shimmery. Above: Outdoor shade with flash . Above: Direct sunlight, no flash. Bottom Line: I truly hope you enjoyed this post! In addition to being the first FOTD of the new year, it is also my birthday (we needn't say which one) and the three year anniversary of Beauty Professor (first post ever can be found HERE...how far we have come)! Great FOTD, love the pics, love the hat. I am tempted by the gray color-- though I have so many hats. I love felt! Thank you...the hat is such good quality...it is 100% wool and totally holds it shape! Happy Birthday, and I hope this year is everything you hope for! I feel blessed, indeed...thanks for reading! Gorgeous as always! I'm also super impressed with that hat! Might have to check it out. Also, I'm smitten with that Zelens lip product! It reminds me of a more luxe version of the IT cosmetics lip vitalities. While I digged that product, the packaging was cheap and problematic. Plus, a bit 'gloopy' for my taste. I see the comparison between the Zelens and the IT Lip Vitality...similar self-adjusting properties, but definitely without the "goop" factor! Happy Birthday and Happy BP Anniversary! I greatly appreciate all the time and effort you put into your reviews. Cheers to many more years of posting! Happy birthday, Happy BP anniversary. I wish u a year of love, health & happiness. Thank you ever so much! Hope your week is going well! Happy Birthday! I have really been enjoying your blog and videos and appreciate your honest opinions. Just ordered the Zelens Age Control foundation and the LMdB Peau Vierge is next on my list when I'm at Nieman Marcus. Hope you are having a wonderful day! Thanks! Your words mean a great deal to me! So excited that the Zelens ad Peau Vierge are on their way to you...do keep me posted on your experience. Hope you enjoy them as much as I do! Hi! I am a new subscriber and am already enchanted with your blog content. Definitely have to get the Zelens lip product. Do you provide info as to where to purchase? Also, interested in good brushes...difficult if not impossible to get in the US as they are made in Japan and sold in UK. Any suggestions? Many thanks. Thank you for subscribing! So glad you are enjoying the blog! I have a direct link to the Zelen's product...it is a Barney's New York exclusive and can definitely be ordered from Barney's online...just click on the product title. In terms of brushes, I really like the Jenny Patinkin Lazy Perfection brushes...they are reviewed on my blog if you want to take a peek. I love the look of the Zelen's lip enhancer. I have a soft spot for Le Volume in Prune too. I just put it on my best of 2014 list! Isn't it dreamy? And the Le Volume in Prune is a favorite...I hope it is never discontinued. Happy Birthday & Anniversary!! Love you & your blog. Here's to many, many more happy, healthy years & amazing product reviews. Love to see you do a full line Zelen's swatch fest! Thank you ever so much, from my heart! xoxo to you and your family!